Using data from the Cassini mission, scientists are unravelling the mechanisms that drive auroral radio emissions at Saturn’s poles, which are key to understanding certain characteristics of the giant ringed planet. Laurent Lamy, an astrophysicist at the LESIA space and astrophysics instrumentation research laboratory (Paris Observatory) and lead author of an article on the subject in the journal Science, gives us the details. It’s a world where everything is invisible. A magnetosphere forms where the solar wind, a stream of electrically charged particles we call ‘plasma’, encounters the magnetic field of a planet like Saturn, Jupiter, Neptune, Uranus, Mercury or Earth. Inside the magnetosphere, plasma motions are dominated by the magnetic field of the host planet. The magnetosphere’s intense electronic activity accelerates electrons, which dissipate their kinetic energy as they’re conducted along magnetic field lines to the poles. When these electrons hit the upper atmosphere, they generate aurorae that can be observed in the ultraviolet, visible and infrared. But thousands of kilometres higher up, auroral radio emissions are also produced: these are low-frequency electromagnetic waves emitted at between 1 and 1,300 KHz, in other words, at wavelengths of several kilometres. This is known as Saturn’s kilometric radiation (SKR). “These radio emissions belong to the family of aurorae and offer the advantage of being observable continuously with electrical antennas that don’t need to be pointed at Saturn, unlike most conventional spectro-imaging instruments,” explains Laurent Lamy. This radiation is a mine of information about Saturn’s magnetosphere. For example, its periodic pulsation is directly related to the rotation of the magnetic field, whereas its sudden bursts—which can last several days—are a sign of auroral storms triggered by solar wind activity. 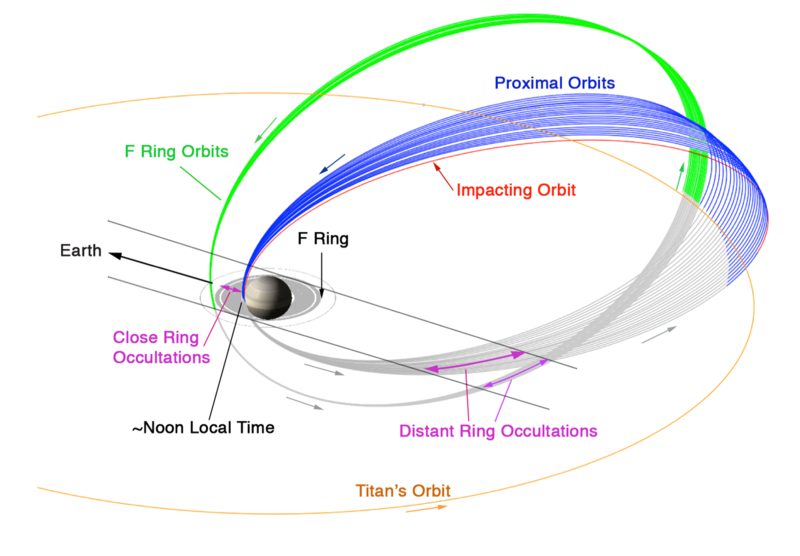 Orbits of the Cassini spacecraft in 2016-2017, F-Ring and then ‘Grand Finale’ (proximal). 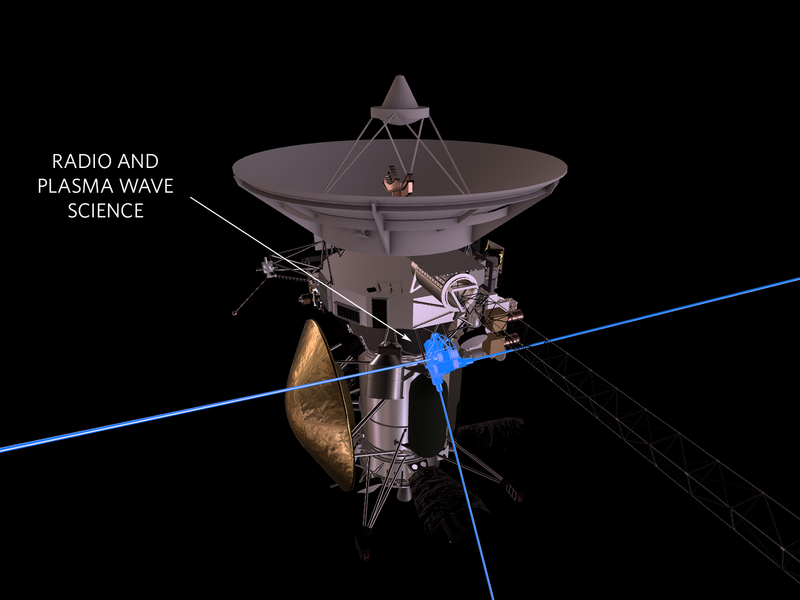 One of the Cassini spacecraft’s suite of plasma instruments was RPWS (Radio and Plasma Wave Science), packed with sensors and receivers. In particular, it featured three 10-metre-long antennas connected to the High Frequency Receiver (HFR), built in 1995 at LESIA (formerly the DESPA space research department of the Paris Observatory) in France with support from CNES. This receiver delivered data of exceptional quality almost continually from the spacecraft’s launch late in 1997 to the last day of the mission at the end of 2017. Analysis of the mechanism driving these radio emissions has yielded its first conclusions, which confirm it’s the same as the one that generates auroral radio emissions on Earth—a plasma electron/wave instability known as the cyclotron maser instability (CMI). This mechanism requires two conditions: the presence of energetic electrons and a low-density but highly magnetized plasma, like that found in auroral regions. “By a happy scheduling coincidence, the Juno mission arrived in polar orbit around Jupiter mid-2016 with the same science goals as Cassini’s Grand Finale, and has already acquired very complementary plasmas measurements that have enabled us to do some comparative planetology on two very different giant planets. It’s a golden age for planetary auroral physics!” says Laurent Lamy with a smile. And advancing our understanding of the complex physics of auroral radio emissions at planets within reach of exploration missions will be vital to unlock the secrets of similar emissions on exoplanets that we will never be able to visit.